Transitional justice is usually associated with international criminal courts and tribunals, but criminal justice is merely one way of dealing with the legacy of conflict and atrocity. Justice is not only a matter of law. It is a process of making sense of the past and accepting the possibility of a shared future together, although perpetrators, victims and bystanders may have very different memories and perceptions, experiences and expectations. This book goes further than providing a legal analysis of the effectiveness of transitional justice and presents a wider perspective. 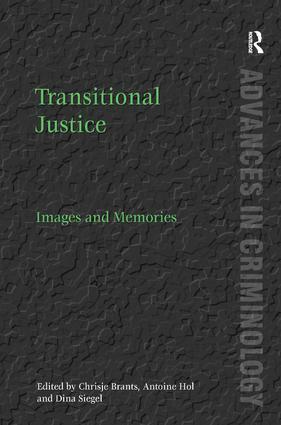 It is a critical appraisal of the different dimensions of the process of transitional justice that affects the imagery and constructions of past experiences and perceptions of conflict. Examining hidden histories of atrocities, public trials and memorialization, processes and rituals, artistic expressions and contradictory perceptions of past conflicts, the book constructs what transitional justice and the imagery involved can mean for a better understanding of the processes of justice, truth and reconciliation. Contents: Introduction, Chrisje Brants; Part I Hidden Histories: The question of Turkey: contested, forgotten and remembered memories, Gülhan Demirci; The lives and times of sentenced Nazi war criminals: re-negotiating guilt and innocence in post-Nuremberg Germany 1950-1975, Susanne Karstedt; René Cassin, state sovereignty and transitional justice in the period of the Second World War, Jay Winter. Part II Processes and Rituals: The theatre of justice: on the educational meaning of criminal trials, Antoine Hol; Memory culture and urban reconstruction: the case of Staro Sajmište in Belgrade, Srdjan Radovic; Transitional justice and local memory: commemoration and social action in Londres 38, Espacio de Memorias, Katrien Klep; The role of ritual is shifting collective dispositions, Danielle Celermajer. Part III Contradictory Perceptions of Conflict and Justice: Communicating the ICC: imagery and image-building in Uganda, Chrisje Brants, Kees Brants and Lauren Gould; Child soldiers: towards a rights-based imagery, Ton Liefaard; Images of international criminal justice in the former Yugoslavia, Sanja Kutnjak Ivković and John Hagan. Part IV Discourse and Artistic Expression: Wagner in Israel: the mixture of politics and music, Dina Siegel; ‘Maybe if the world had paid more attention’. Western cinematic perspectives on the Rwandan genocide and the role of the West: Hotel Rwanda, Shooting Dogs and Sometimes in April, Bernadette Kester; An eye for an eye: the imagery of the 1947 Partition (India, Pakistan), Lodewijk Brunt; Index. Chrisje Brants, Professor of Criminal Law and Procedure; Antoine Hol, Professor of Jurisprudence and Legal Philosophy; Dina Siegel, Professor of Criminology, all at Utrecht University, The Netherlands.